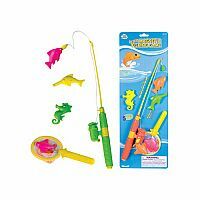 This deluxe set includes a 15 inch long fishing rod with retractable fishing line and magnetic lure. Reel makes a ratcheting sound. Comes with five colorful floating fish and hand net.